As preorders for EB01: Comic Style Vol. 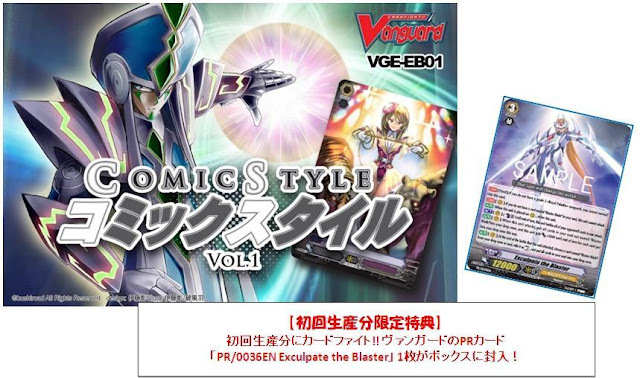 1 become available, various distributors are now leaking that the manga promo card Exculpate the Blaster will be included as a promotional tie-in, much as The Dark Dictator followed for BT04. Exculpate is a unique transformation-based grade 3 for the Royal Paladins, being intended as a finishing move for the Blaster deck capable of wiping out an entire field in addition to the opponent's vanguard; however, there are severe restrictions on its use requiring the vanguard to already be grade 3, and for Blaster Blade to be in the soul. Exculpate originally debuted in Volume 5, Chapter 21 of the Cardfight!! Vanguard manga written and illustrated by Itou Akira, as the finishing blow used by Aichi to overcome Suzugamori Ren's Phantom Blaster Dragon. Most recently, the card appeared in the Fighter's Climax 2012 national championship, where it was included as a single copy in the junior championship runner-up Shinhama Yoshifumi's decklist. VGE-EB01: Comic Style Vol.1 is the first Cardfight!! Vanguard extra booster, and at release will be the tenth booster set to be released in English overall. The set is composed entirely from cards that were originally designed for the Cardfight!! Vanguard manga, Itou's first original work following his departure from Yu-Gi-Oh! R. The primary features of the set are the solidification of the Raizer series as a distinct playstyle for the Nova Grapplre clan, the introduction of the Murakumo clan and their lockdown strategy, the Machining units for Megacolony which gain power from having other Machining in the soul, as well as minor reinforcement for Royal Paladin and Kagerou. Bellicosity Dragon in particular has drawn attention for allowing Kagerou decks to unflip their counterblast, letting them repeat the use of skills and take the strain away from their damage zone. While all of the cards in the set were designed by Itou, only the SP artwork for the Sage of Guidance, Zenon, was completely illustrated by him. The inclusion of Exculpate in the set is appropriate; much as Dictator was appropriate for BT04 as it was the Shadow Paladins' core set, Exculpate is so because it is the climax card of the manga's first major story arc. Like Zenon, it is also purely Itou's work. The manga has yet to be officially serialized in individual volumes for English distribution, although the first chapter has been translated in a free promotional booklet often handed out as a participation prize at shop tournaments and at World Championship 2012 regional events. Thus far, fan translations of the manga have been filling the gap.